The ferry from Ibiza to Formentera takes you comfortably from the south to the port of La Savina in Formentera's north. Spend a day or several days on the enchanting neighbouring island! The practical and fast crossing by ferry from Ibiza to Formentera allows you to explore the neighbouring island in a flexible way, discovering and experiencing exactly what appeals to you most. Beautiful beaches and picturesque villages await you. 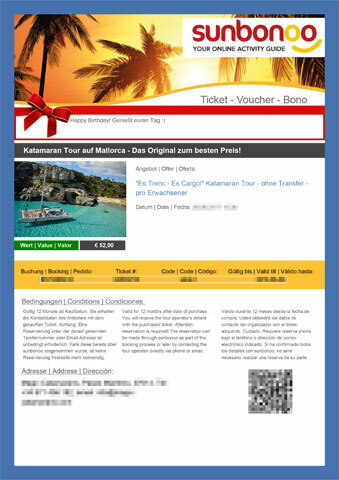 With the aquabus Ibiza you can arrange your stay individually, as you can choose from different ticket variants. Season 2: 16.5. - 30.09. Travel time: approx. 50 min. Please note the timetable for ferries from Ibiza to Formentera and back. The ferry boat from Ibiza to Formentera takes you in a short time to the breathtaking neighbouring island, whose beaches are among the most beautiful in Europe. The small Balearic island lies in the middle of a nature reserve, the Parque Natural de Ses Salines. You can flexibly decide whether you want to explore Formentera for one day or several days. There is a lot to discover on the island. Enjoy long walks on the beach with a view of the turquoise blue clear water and the wonderful dunes in the middle of fragrant pine forests. Visit the great viewpoints with your rental car, on foot or by bike, such as the famous Cap de Barbaria lighthouse - an absolute photo hotspot and a must for your holiday photo album. Explore directly the charming village of La Savina, where you will arrive by ferry from Ibiza-Formentera. The marina is also worth seeing. You will find cafés and restaurants there and can rent a bike directly if you want to explore the island on two wheels, which is only 19 km long. There are cycle paths along the coast and inland in idyllic surroundings. The island is very flat, so you can cycle around and enjoy the landscape. You can also visit the small neighbouring island of Espalmador, once you have reached it by ferry from Ibiza Formentera. It is located only 150 m from Formentera and is approached by shuttle boats from La Savina. There are two beautiful white sandy beaches on the island, which is a nature reserve. There you can relax, lie in the sun and refresh yourself in the sea. But also Formentera's beaches are breathtaking, like the Playa de ses Illetes. The island is also an ideal destination for hikers. There are hiking trails for every taste and with breathtaking views. In summer, don't miss the popular hippie market, which takes place twice a week in Pilar de la Mola. You will find typical island products, clothing and handicrafts in combination with live music, which creates a special atmosphere. Not far away is the lighthouse La Mola, which is situated on cliffs at an altitude of about 200 m on the highest point of the island. From there you have an impressive view of the Mediterranean Sea. Don't miss Sant Francesc de Formentera, the largest town on the Balearic island. The landmark of the city is the church of the same name. Here you can shop in the numerous shops and end the evening in a bar. With the ferry from Ibiza to Formentera you are flexible and experience Formentera just as you want to experience the enchanting island. The Aquabus Ibiza timetable makes it possible! You're reviewing: All year round by ferry from Ibiza to Formentera - from the south. How do you rate this product?